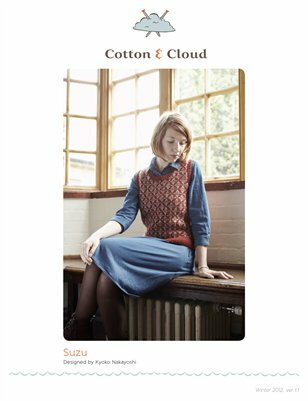 This is a knitting pattern for Suzu, a Japanese inspired modern Fair Isle vest. This low-necked vest features an all-over Fair Isle pattern. A vertical-striped steek is used for the armholes and front neck, allowing the entire garment to be knitted in the round. Steeks are sections of "waste" knitted fabric that are later cut to create the openings. Short-row shaping is also used to create an elegant shoulder line.